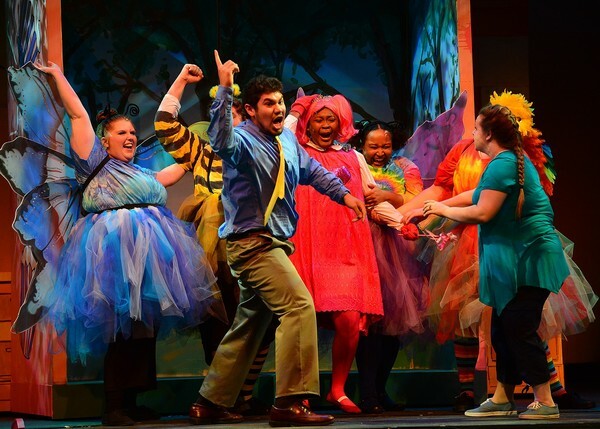 NACOGDOCHES, Texas - East Texas audiences have only two more chances to see 'Pinkalicious the Musical' presented by the Stephen F. Austin State University School of Theatre in its SummerStage Festival. The children's show, featuring, from left, theatre students Kaitlyn Kirby, James Burns, E.J. Villanueva, Crayten Clendion, Kiara Hawkins, Shane Reynolds and Miriam Newman, will be presented at 2 p.m. Wednesday, July 18, and 10 a.m. Thursday, July 19, in W.M. Turner Auditorium on the SFA campus. "Pinkalicious the Musical" is by Elizabeth Kann and Victoria Kann with music by John Gregor. Call the SFA Fine Arts Box Office at (936) 468-6407 or visit finearts.sfasu.edu for ticketing information.